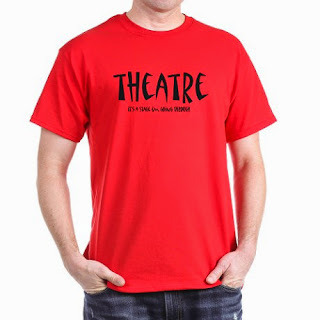 The mens basic T-shirt from CafePress can go to the theater under a blazer and fit right in. Photo from CafePress Web site. HEADS UP: Dilemma: The last days. YOU: bewitched, bothered and bewildered. US: elves at VEVLYN’S PEN are, of course, on the case. Practically every day through 24 Dec., we will introduce at least one or a series of products, items and brands that we believe is worthy of consideration as a holiday gift(s). Now, stop your fretting. DRESSING up for the theater is no longer de rigueur, we know, but dressing is. 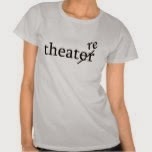 Two outfits – CafePress and Zazzle Apparel – offer theater-themed, customizable T-shirts that will look sharp under a neat blazer or classy sports jacket. Even the black-tie type can sport a T-shirt or a hoodie to rehearsals. 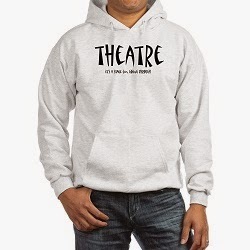 Practice makes perfect in the CafePress hoodie at rehearsals. Photo from CafePress Web site. Part of the fun of Zazzle Apparel T-shirts, aside from a certain competition, is that words and images can be added to them. Photo from Zazzle Apparel Web site. “Stage theatre is spelled with an 're' not an 'er'. For those theatre diehards who want to remind everyone that stage theatre is way more awesome than film.” (http://www.bit.ly/1vhXrqd).